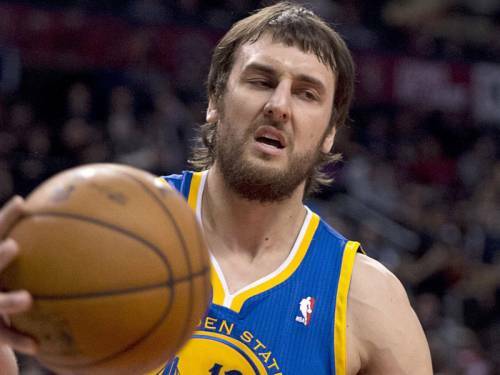 * Andrew Bogut is fed up with the Warriors’ defense and pulling no punches in identifying where the problem lies. And some people don’t like it. * A Dallas Mavericks dance video. Ah, Dirk Nowitzki dancing is always a special treat. * Russell Westbrook doesn’t like this question. I don’t blame him. * DeMar DeRozan smashes on poor Timofey Mozgov. * The lads over at Believe The Hype scored an interview with Robert Sacre. Well worth a listen. * Will Ferrell plays the part of red coat security guard at the Lakers home game against Phoenix. * The Miami Death Machine in full flight. * Rudy Gay hits two game winners this week against Indiana (check out the commentary on this one) and Denver. Gotta give him credit, he’s establishing himself as a legit clutch performer (but he’s still an inefficient player overall, i.e. a volume shooter with low percentage and a poor three-point shooter). * Check out the Warriors’ new skin-tight sleeved unis. Yowza! * An interesting Q&A with Dirk Nowitzki. * Tayshaun Prince meets the Pistons’ fan who became famous for removing his Prince jersey following the trade. * Blake Griffin drops the hammer on Philly.